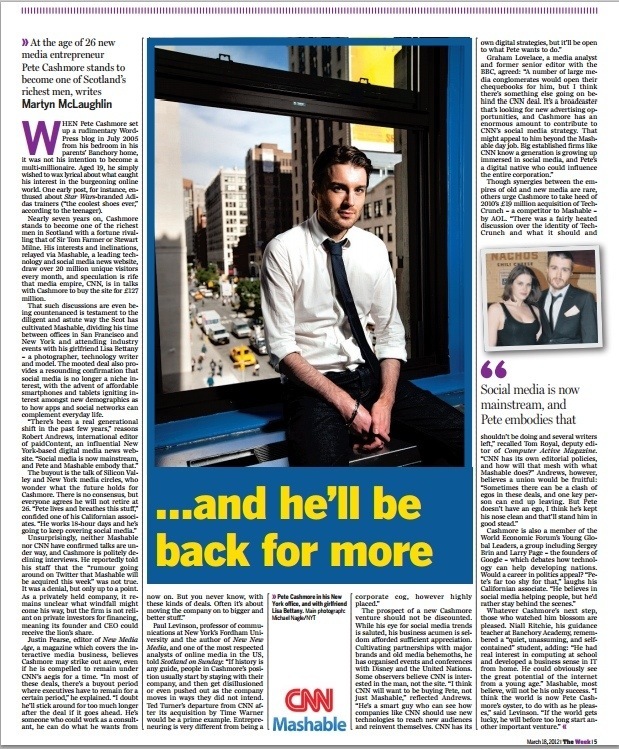 Cashmore by … – WHEN Pete Cashmore set up a rudimentary WordPress blog in July 2005 from his bedroom in his parents’ Banchory home, it was not his intention to become a multi-millionaire. Aged 19, he simply wished to wax lyrical about what caught his interest in the burgeoning online world. One early post, for instance, enthused about Star Wars-branded Adidas trainers (“the coolest shoes ever,” according to the teenager). Nearly seven years on, Cashmore stands to become one of the richest men in Scotland with a fortune rivalling that of Sir Tom Farmer or Stewart Milne. His interests and inclinations, relayed via Mashable, a leading technology and social media news website, draw over 20 million unique visitors every month, and speculation is rife that media empire, CNN, is in talks with Cashmore to buy the site for £127 million. That such discussions are even being countenanced is testament to the diligent and astute way the Scot has cultivated Mashable, dividing his time between offices in San Francisco and New York and attending industry events with his girlfriend Lisa Bettany – a photographer, technology writer and model. The mooted deal also provides a resounding confirmation that social media is no longer a niche interest, with the advent of affordable smartphones and tablets igniting interest amongst new demographics as to how apps and social networks can complement everyday life. Unsurprisingly, neither Mashable nor CNN have confirmed talks are under way, and Cashmore is politely declining interviews. He reportedly told his staff that the “rumour going around on Twitter that Mashable will be acquired this week” was not true. It was a denial, but only up to a point. As a privately held company, it remains unclear what windfall might come his way, but the firm is not reliant on private investors for financing, meaning its founder and CEO could receive the lion’s share.